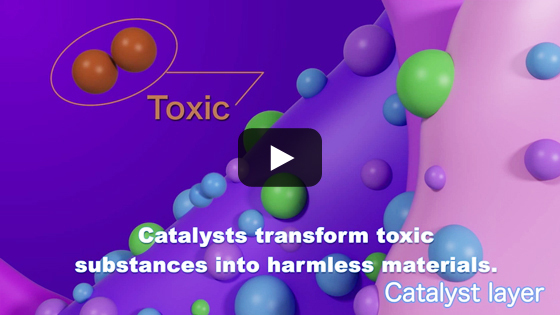 In addition to its core lineup of automotive catalysts (3-way catalyst, diesel catalyst), Cataler promotes worldwide environmental conservation with electrode catalysts for fuel cells, motorcycle catalysts, activated carbon products, and carbon materials for capacitors. We boast world class technology in the realm of catalysts, a defining factor in the environmental performance of automobiles. Catalyst technology is utilized in motorcycles, PWC and a full range of other internal-combustion engines. We contribute to environmental cleanup in everyday life through the utilization of catalysts and the adsorption power of activated carbon. Cataler also actively develops advanced technology such as electrode catalysts for fuel cells and carbon materials for capacitors.